For use with both beef and non-lactating dairy cattle primarily for the control of horn flies. Also controls Gulf Coast ticks and spinose ear ticks. Aids in the control of face flies, lice, stable flies, and house flies. Effective against pyrethroid-resistant horn flies for up to five months. 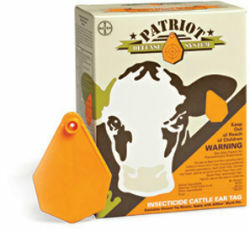 Only insecticide ear tag on the market that contains 40% diazinon.